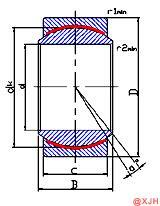 If a lubricating film is formed on the surface of the sliding bearing to separate the surface of the moving pair, the sliding friction can be greatly reduced.Spherical Plain Bearing GE.UK Series has a large load carrying capacity, high rotation precision, and a lubricating film with impact resistance. Therefore, it has been widely used in engineering. If a lubricating film is formed on the surface of the sliding bearing to separate the surface of the moving pair, the sliding friction can be greatly reduced. Since the surface of the moving pair is not in direct contact, wear is also avoided. Spherical Plain Bearing GE.UK Series has a large load carrying capacity, high rotation precision, and a lubricating film with impact resistance. Therefore, it has been widely used in engineering. The formation of the lubricating film is the basic condition for the normal operation of the Spherical Plain Bearing GE.UK Series. The factors affecting the formation of the lubricating film include the lubrication mode, the relative motion speed of the motion pair, the physical properties of the lubricant, and the roughness of the moving pair surface. The design of the Spherical Plain Bearing GE.UK Series shall be based on the operating conditions of the bearing, determine the type of construction of the bearing, select the lubricant and lubrication method, and determine the geometric parameters of the bearing. 4. There is a layer of PTFE sintered copper wire in the middle of the inner and outer ring. 5, performance characteristics: self-lubricating, resistance to Utamaro loss, self-aligning, low friction characteristics, suitable for low-speed, heavy-duty mechanical Mechanism.